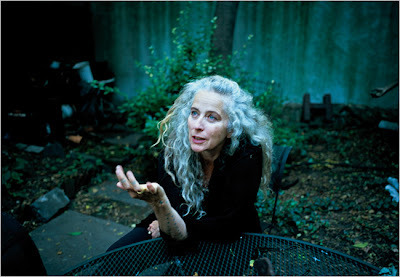 Kiki Smith is a feminist multi-media artist who, for the past twenty years, has explored the body from inside to outside, conflating the borders between the two, and has helped to restore the human body to a central place in contemporary art. Though western art has long been fascinated with the human body, especially the female body, the body parts she is interested are not typically found in art. She examines body functions and parts that are culturally taboo and embarrassing. Many of her works are body fragments, such as prints taken from organs or a porcelain pelvis on a pedestal. 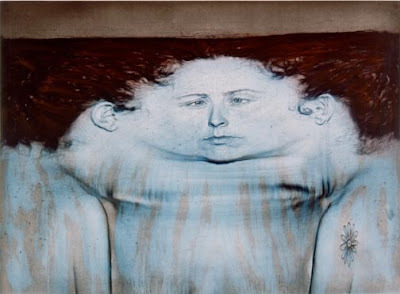 Blood, fluids, sperm, tears all appear in her works as emotionally charged elements. Her art is messy, open, uncomfortable. It is indecorous rather than polite, personal rather than official, unpredictable rather focused, meandering rather than goal oriented. Her figures bridge the gap between seductive beauty and grotesque body, open, leaking, uncontained. infectious. I love the way she observes aspects of art she adores and turns it on it's head to learn something that is hidden to all except her. She speaks of a bronze figure she created "Lilith" which, in reviewing the drawing of the design, pinned it to the wall...and the twist on the piece happened. Kiki decided to hang the bronze figure on the wall, just like her sketch. Her work is very concept/idea driven with a force but a sweetness that tugs at you. 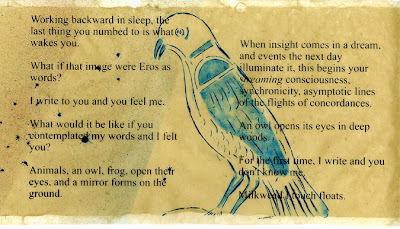 CONCORDANCE is a new collaborative work by two acclaimed contemporary artists, poet Mei-mei Berssenbrugge and sculptor Kiki Smith working with book artist, Anne McKeown. Inspired by Smith's image of a dandelion, whose floating silks she compares to reading, the poem traces agreements and embeddings of human and animal bodies, ideas, dreams and emotion in a concordance of parallel and contingent contexts. "Then it's possible to undo misunderstanding from inside by tracing the flight or thread of empty space running through things." Then what if, in that bond, "images were Eros as words?" In Smith's etchings, reading, as Eros, is drawn as seeds, feathers, star-like explosions, pods, wide-eyed, unblinking owls. "Animals . . . open their eyes, and a mirror forms on the ground." 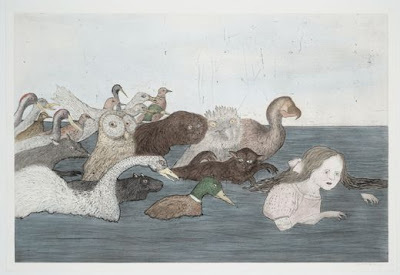 The effects of the verbal images and gray-blue inked drawings are stunning and other-worldly.